During the 21st century, there has been a paradigm shift regarding singing and aging. The older generation is remaining active longer and wishes to continue to participate in the life-giving, fully athletic activity of singing as long as possible. Singing can be a healthy, invigorating activity in the lives of people of every age. Singing “from cradle to grave” is possible if each singer and singing teacher adjusts the expectations regarding tone quality, range, agility, and stamina with each season of life. Every singer is aging daily. Changes begin early and persist throughout life. This book explains how to address the spectrum of issues that insure a healthy, long life of singing. The strategies presented here will help singers maintain a youthful, vibrant voice. The text offers advice to singers, voice teachers, choral conductors, church musicians, and classroom music teachers regarding repertoire choice and exercise regimens. In collaboration with medical professionals and a vocal pedagogue, the author presents systematically the steps to be taken from childhood through adulthood. 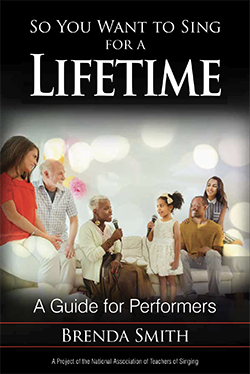 So You Want to Sing for a Lifetime includes guest-authored chapters by Scott McCoy and Wendy LeBorgne as well as Dr. Robert T. Sataloff, MD. The book should serve as a useful guide to amateur and professional singers, music educators, choral conductors, church musicians, and private voice teachers. It is intended to give everyone the opportunity to understand the voice and its potential as the mirror of one’s soul throughout life.